Paul George is playing the best basketball of his life, James Harden is still everything to Houston and the Bulls are the most dysfunctional mess in all of basketball. The holidays are upon us, and we are hitting the heart of the NBA's regular season. There are stories to enjoy all over the league. 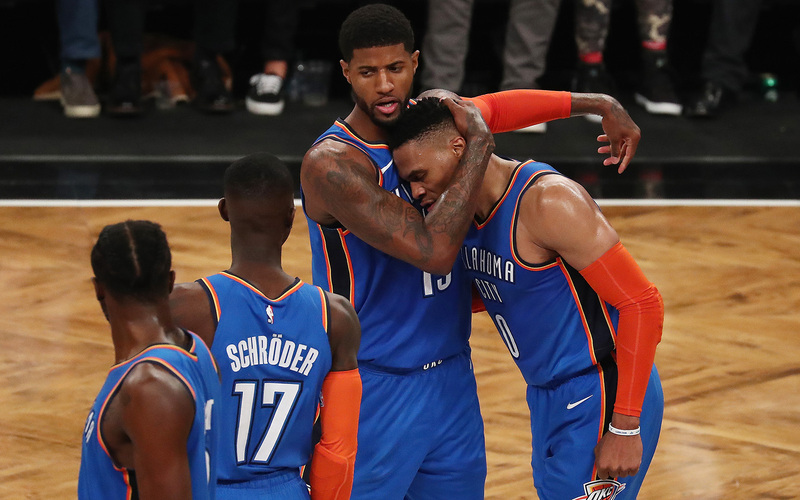 At the moment: Paul George and the Thunder look worlds better than where they were last April, the Rockets are not dead yet, Jim Boylen continues to spread his wings with the Bulls, John Wall is showing signs of life, and everyone should watch the Kings. Here are five notes on the NBA this week. 1. Paul George will decide how far the Thunder go. The final two games of last April's Jazz series gave us the full Russell Westbrook spectrum: In Game 5, Westbrook was a force of nature unlike anything else in the NBA. With OKC down 25, he scored 33 points in the second half to bring the Thunder all the way back to win. It was the kind of mind-blowing performance that should have been unforgettable, except that all the memories were immediately tempered by the hangover in Game 6. Westbrook took 43 shots in that game (including 19 threes), the madness was less productive this time, and the Thunder sputtered out of the playoffs with another clear look at the limits of their best player. Which is to say: Westbrook was spectacular first in victory and then in defeat, and all of it overshadowed Paul George. George went 2-of-16 for 5 points in Game 6 against the Jazz. He was terrible at the start, and by the second half, he was more or less invisible. In OKC's two wins against Utah, George averaged 35 PPG on 54% shooting. In OKC's four losses, George shot 32% and averaged 19.5 PPG. He was outplayed by Joe Ingles for long stretches of that series, and as Donovan Mitchell filleted the OKC defense, George's defensive impact was muted. Generally speaking, it was a harrowing two weeks for "Playoff P"—and all those memories were difficult to shake when George signed his four-year, $137 million contract this summer. Back in July, George was coming off knee surgery in May, a late-season slump that saw him admit his shooting mechanics were "funny", and that playoff performance. Signing George was a huge win for OKC given the alternatives, but still. There were reasons to be skeptical. Midway through December, that skepticism now looks ridiculous. George has been the best player on the Thunder. With Westbrook still shaking off the rust from preseason surgery and an early–season ankle injury, George has stabilized the team on both ends of the floor. Monday night against the Bulls, Chicago had pulled within four points of OKC midway through the second quarter. For a second it looked like the game might turn into another inexplicable close call that could down to the wire. Shortly thereafter, George went off for 16 points in the final 4:47 of the second quarter. It was a 20-point game by halftime. In general, George now becomes one of the most interesting players in the NBA. Westbrook is still getting some of his shooting back, but he's roughly the same player he's always been. The rest of the Thunder are long and springy and active all over the floor. Adams is reliably excellent. But all of that is familiar. It's George who's hit another level. He's playing the best basketball of his life. If this continues, the Thunder are a different team, and one that everyone should take more seriously. Most people view Westbrook’s MVP as invalid to some degree due to what has transpired in the playoffs and the season after he won. My question is: Should the same logic be applied to Harden? This is the second time in his career where his teams plummet after a season of success. The past five days have been a fantastic response from Harden. Thursday against the Lakers he went for 50 points, 11 assists, and 10 rebounds. Saturday against Memphis he went for 32, 10, and 12. Monday against Utah, he added another 47 points to carry Houston through a fourth quarter that was close throughout the final six minutes. He hit jumper after jumper after jumper to bury the Jazz; it was pure evil, complete with the perfectly obnoxious step-back travel and subsequent three-point shooting foul. Somewhere in the DM wildnerness, Steve Kerr is venting. But lest anyone grumble that he is getting by on free throws and gimmicks—arguably the only rational response to his foul-drawing dark arts—Harden followed that sequence by draining yet another a cold-blooded step-back three to end the game 30 seconds later. So Harden is still incredible. That's good news for the Rockets, and Houston has now won four straight games and six of the past nine. There is reason for hope. Less encouraging: Houston only got 11 points from its bench. Before a stretch that features three games in the five days, every Rockets starter played at least 35 minutes Monday. Chris Paul still doesn't look right, and he was 3 of 10 from the floor. Eric Gordon was 4 of 13. And while Harden was brilliant for the entire game, the Rockets needed every single bit of it to beat Utah. In other words, Monday night made it clear (again) that Harden is why nobody should write off Houston this year. But it was also a reminder that Rockets issues remain very real. Until further notice, Harden looks like the only solution they have. 3. The Jim Boylen adventure continues. If the question was "Which NBA coach is most likely to arm bar an opponent and one of his own players at the same time?" there was only one correct answer. Monday night just made it official. That sequence came late in the third quarter against OKC. Earlier in that same quarter, the Bulls began the second half by trapping the Thunder superstars on every possession, a strategy that led to a succession of wide-open looks at the rim for OKC. I'm not sure whether this is an indictment of the coaching or the personnel, but there's no reason it can't be both. In any case, it felt like the Bulls were getting dunked on every other possession. And indeed, according to the play-by-play, every point the Thunder scored in the third quarter was either a dunk, a lay-up, or a free throw. Perfect. Additional note: I wasn't watching by the end of the game, but it's heartening to learn that Boylen was still running a full–court press down 23 points in the final minutes. I hope someone is making a documentary about this Bulls season. 4. John Wall is showing signs of life. These Lakers highlights will bring back memories of a point guard that might make you want to run through a brick wall to scream at Colin Cowherd. Wall did everything Sunday afternoon. He exploded up and down the court and made the Lakers look like they were going half speed; he barrelled into Lonzo Ball for a demoralizing fast-break block; he hit threes; he had 14 assists. It was wonderful. The whole game was a lot like the Celtics game last week, where Wall put up 34 points and 13 assists. All of it was a nice reminder that Wall's maybe not as hopelessly washed up as he's looked at various points this season. Now, a cynic might point out that Wall's ability to turn it on in showcase games against LeBron and Kyrie just underscores how depressing the rest of his season has been, but that's beside the point. The Wizards were a league-wide punchline again this weekend. They are betting the season on the ghost of Trevor Ariza, and compared to betting on Austin Rivers and Kelly Oubre, the Ariza play is actually fairly sensible. Otto Porter is making more money than Kawhi Leonard and he's averaging 11.7 PPG this season. Nobody knows where Dwight Howard is. Bradley Beal probably wants to be traded. In the past 72 hours I've had multiple conversations in which I expressed sincere excitement about what's possible for Sam Dekker in Washington. Let me have these John Wall highlights. 5. Everyone play it cool with De'Aaron Fox and the Kings. Monday afternoon, the plan was to lead this column by writing about everything that has happened with Sacramento this season. The Kings beat the Mavericks in Dallas Sunday night, they are still above .500 after two months, and De'Aaron Fox is getting not-totally-crazy All-Star buzz. This is wonderful. Still: I had misgivings. Apart from all the normal reasons to be careful about trusting the Kings, I was worried that celebrating this Kings season might curse them and ruin this. The Kings have been one of the best stories in the NBA this season. The play at blinding speed, every game ends in the 120s or 130s, and 3-4 times each week they remind everyone that Iman Shumpert is still in the league. It's great. And then, when the Kings were down 30 at halftime to the Wolves on Monday, I realized what I had done, and I realized what we all have to do. Don't write about the Kings, don't talk about the Kings, don't even begin to think about whether the Kings could possibly be a factor in the playoff race. Just watch them as often as possible, and try to play it cool. Also, 30 point loss or not, vote for De'Aaron Fox and Buddy Hield to make the All-Star Game.